Women's low top trainers from Ash. Crafted from smooth leather to create a sleek upper, the 'Dazed' tennis shoes feature a rounded toe, classic lace-up fastening and tonal stud detailing at the heel, in the form of stars and coned studs. Complete with off-white suede panel to the padded collar and ventilation eyelets to the inside and outside foot for breathability. Set upon a durable rubber sole with red star motif. Branding to the tongue. Upper: Leather. Sole: Rubber. 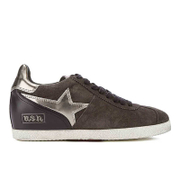 ‘Guepard Bis’ suede wedged trainers from Ash. Constructed from premium suede uppers, the low top sneakers comprise a lace up front fastening and a padded collar for additional support. Set upon a concealed low wedge heel for subtle added height with a contrast rubber sole. Complete with leather panel detailing and embossed Ash branding to the side and heel counter. 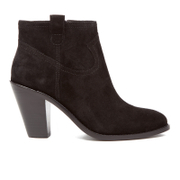 Heel Height: 2.5” Upper: Suede and Leather. Sole: Rubber. 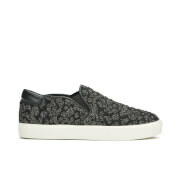 Women's slip on trainers from Ash with lurex knit upper and abstract leopard print design. Set upon a thick rubber sole, the skater-inspired 'Impuls' trainers combine fashion with function, featuring a rounded toe, elasticated side gores and a padded collar for comfort. Complete with leather lining. Upper: Textile. Lining: Leather. Sole: Rubber. Platform Height: 1 . 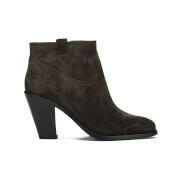 Women's suede ankle boots from Ash. Showcasing smooth suede uppers with tonal, Western-inspired stitching, the heeled 'Ivana' boots feature a pointed toe, stacked heel and inside zip for easy entry. Complete with pull loop to the ankle and durable leather sole. Upper: Suede. Sole: Leather. Heel Height: 3.5 .